The way people shop is changing. In today’s digital society, people are starting to forego the traditional Black Friday shopping experience in favor of online shopping on Cyber Monday. Due to this shift in the way people shop, it is important that stores get on board with new marketing techniques and make sure your website is fully prepared, in order to really grab the most amount of sales during this pivotal Holiday season. One of the worst things that can happen on Cyber Monday is that your site gets an increased amount of traffic, but crashes your site because you can’t handle the capacity. In order to avoid this huge pitfall that could potentially cost you quite a bit of sales, you may want to speak with your hosting company and increase your bandwidth. Trust me, you do not want your site to crash on this most important of sales days. You will also want to test everything a few days ahead of time and make sure EVERYTHING is properly working. Check your site speed, make sure everything is in stock and your payment system is properly working… This is the best time to talk to your hosting company, web designer, site manager and anyone else you need to to ensure everything is up and running and ready to handle excess amounts of traffic. 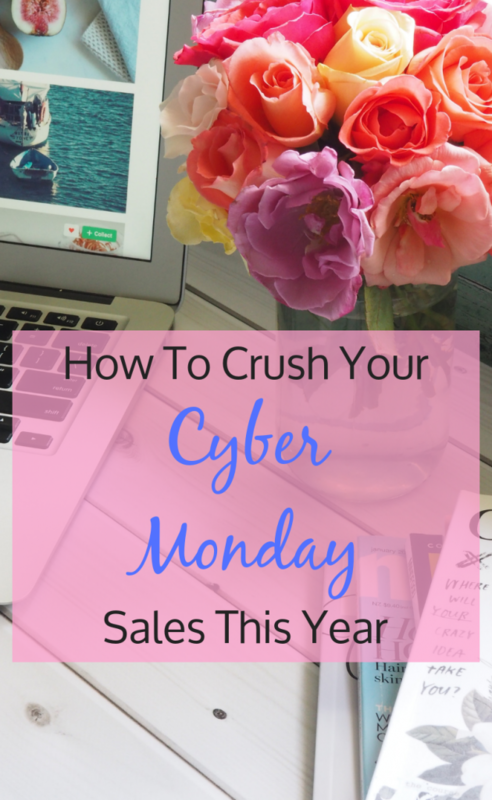 If you want to bring in the big sales on Cyber Monday, you need to do some serious marketing. Starting today, you should be pushing and marketing your sales and specials to get people interested and start collecting e-mail addresses. Want to build some serious hype? Run a giveaway! This can be for a product or a gift card to your shop…Anything that will get people excited about what you sell and offer. You can encourage people to share your post, tag a friend, or sign up for your e-mail list as entries into your giveaway. This will get people excited and will expand your reach at the same time! If you are running a subscription service, it is highly advisable that you offer a free or low cost one month trial of your service. People love to try things before they commit, so this is an excellent way to get customers in and wow them so you can retain their business for the future! Offer and promote one day only sales! Customers don’t want to feel like they are missing out, so making a sale a one day only special will entice them to buy right now to avoid missing out on a killer deal. You should begin advertising these deals as soon as you can via your e-mail list and paid Social Media promotions. Of course you want to offer amazing discounts on Cyber Monday, but you should also be trying to upsell at the same time. Offer your customers something of value to improve upon something they are already ordering. The largest issue facing online retailers, especially on Cyber Monday, is the abandoned cart dilemma. You can fight this though! You can see our full post here that will really help you fight the abandoned cart and redirect your campaigns! This may seem counterproductive, but limit the amount of coupons accepted, or only do the sale for a certain amount of hours… Psychologically, people don’t want to miss out and if they thing something is exclusive, they want it even more! One good tip is to add a “sales countdown timer” to your site as well as in your marketing e-mails. This will reiterate that there is only a short amount of time these deals will be available. You can turn one time deal shoppers from Cyber Monday into lifelong clients by offering just the right incentives. I would highly recommend some sort of rewards program that rewards customers for spending money at your shop. For every so much they spend, they can earn a coupon code for a percentage off or dollars off.. This encourages people to actually spend more than they initially would have in order to hit a threshold. If you have questions about setting up your own rewards program, or want to go ahead and get your site optimized for this pivotal holiday sales season, the experts here at Product Cart would love to help you!